If you run a business, you should realize that along with developing sound marketing strategies, you need to also take note of the company infrastructure and ensure that all your employees are getting a favorable working environment. One such crucial aspect that you must take note of is the electrical panels and systems in the office. We, at JPEG INC., are a licensed and insured electrical service with a team of talented, knowledgeable, and hard working professional electricians who bring you the latest technology. Right from the dedicated computer circuits, data and communication lines, code corrections, emergency generators or standby power, commercial wiring, ballast lamps CAT6 cabling, fiber optic cabling, industrial lighting, and other electrical inspections as well, we can provide you with a wide range of services for your business. If you are based in areas like Fort Lauderdale, Hollywood FL, Miramar FL, Plantation FL, Sunrise FL, and Weston FL, you can rely on us. Here, we have put together a few reasons why you must hire a commercial electrical service. Take a look. First of all, if there is an electrical failure or breakdown, it will affect the smooth workflow of your business and affect the productivity levels of your employees. 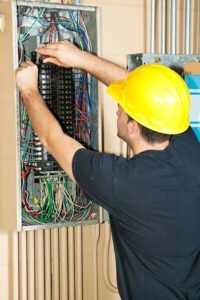 In order to ensure an uninterrupted flow of work as per the plan, you should hire a commercial electrician who can fix the issues immediately. Suppose there is an essential project delivery which has to be done within a stipulated date and there occurs an issue in the cabling or communication and data line. Then, your project will be at stake. Moreover, if the efficient lighting or air-conditioning systems don’t function properly in the office, it will be a major source of discomfort for your employees. So, without any further delay, you should quickly look for a company which offers you established commercial electrical solutions. And if you are interested in us, contact us immediately.